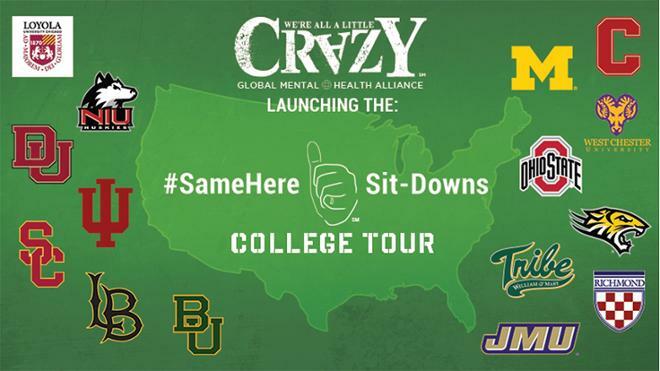 We’re thrilled to have been chosen as one of the first 15 campuses selected as a stop for the #SameHere Sit-Down College Campus Tour – an initiative started by the mental health non-profit, We Are All A Little "Crazy," Founder, Eric Kussin – a professional sports veteran, alongside ESPN’s Darren Rovell, will lead an interactive and entertaining storytelling discussion with celebrity influencers, who will be opening up about their own mental health battles. Students and faculty will be invited to join the conversation on managing stress, anxiety, and trauma – challenges we all face – as we look to continue to lead and change the way mental health is approached on campus. This is all part of a Global #SameHere Movement and we are thrilled to be chosen to partner. Richmond Athletics and the Student Development Health & Well-Being Unit are proud sponsors of this event! PLEASE NOTE: Tickets are not required for this event and seating is first-come, first-served.